A team of researchers from Denmark, Italy and Portugal recently discovered a new mechanism for controlling electronic devices using molecules. The researchers have shown that the ferroelectric ordering of polar molecules attached to the edge of graphene can be toggle-switched by an electrostatic gate and can be used for memory devices and sensors. Molecular electronics aims to use individual molecules to control electronics. The large library of molecules and techniques to modify them can create more sophisticated electronics than previously thought possible. The normal hindrance is the small size of the molecules. It's possible to create them, but they are incredibly difficult to handle. It is almost impossible to manipulate small enough features in ordinary materials to electrically connect with individual molecules. The most common approach is the so-called mechanical break junction, which relies on creating “cracks” in wires small enough to bridge individual molecules. Obviously, this is not an easy task, especially because the molecules have many different ways to attach onto the wires at the atomic level. In nanoscale contacts even the smallest difference matters. Jose Caridad from Technical University of Denmark came up with very a different approach: to use something that is already atomically small to trap the molecules: the 0.3 nm wide edge of graphene. The researchers sandwiched graphene layers in hexagonal boron nitride crystals – which can play the role of an insulator. They carved square-shaped devices using common etching processes that cuts through the hBN-graphene-hBN sandwich and leaves the 1 atom thin graphene edge exposed. While such devices are usually not particularly sensitive to the environment, the researchers found a way to make the graphene device react to water molecules in an unexpected way. The idea is to control the edge chemistry: the researchers attached different atoms to the graphene edges, before exposing them to water vapor and other polar molecules. With fluorine termination (which is common), the graphene nearly didn't respond. 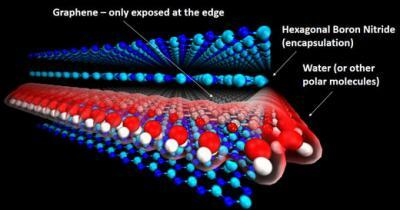 Instead, with oxygen, the graphene device became much more sensitive to the presence of polar molecules. A series of experiments showed that polar molecules can be aligned by a user-controlled electrical field in two positions (just like a toggle switch). This drastically changes the electron distribution in the graphene layer, and thereby the resistance and capacitance of the device. The key aspects of this behavior were successfully modeled and explained theoretically by atomistic and analytical calculations, led by Professor Mads Brandbyge at DTU Nanotech. The effect seems to be persistent: the aligned water molecules keep their orientation even when removing the field, creating exactly the type of hysteresis needed for novel memory devices. Peter Bøggild, Professor at DTU Nanotech: “There are two important things we have learned. First: even for quite large devices – 5 µm in size – the behavior is completely controlled by a few molecules sitting along the edge. Using graphene edges to manipulate molecules is a fantastic way to trap molecules and explore new device functionalities. It also tells us that we have to careful; we are not always interested in devices changing their behavior in this way. We may think that we have protected the graphene, but if the edges are still exposed, all bets are off. Graphene is a nanomaterial where every atom counts – and the treatment of those delicate edges is absolutely crucial for any future electronics based on graphene”. “We have a new platform for so-called memristive and memcapacitive devices – nanoscale devices that can be switched between different states and remember it,” says Jose Caridad, who initially discovered the effect and led the project, “This technology is important for internet of things and neuromorphic computing, and that’s where I want to go with it”.